City fruit. There's a surprising amount of it about on trees and shrubs in the street, parks, gardens and abandoned areas, just waiting to be turned into jams, jellies, sauces, chutneys and wine. Living near Hampstead Heath, I can also add woodlands and hedgerows to that list. Autumn abundance seems to have arrived early this year; masses of rowan berries, rose hips and haws are ripening in the streets. Large juicy blackberries lurked (past tense, the children have surprisingly long arms!) just out of reach on the nearby railway line and I was almost caught on the hop with elderberries. I love the slightly exotic look of elderberries: red stems and glossy black fruits, they are the Morticia Adams of the hedgerow. Toxic (as in severe tummy upset) when raw but delicious and edible when cooked into cordials, jams and wine. 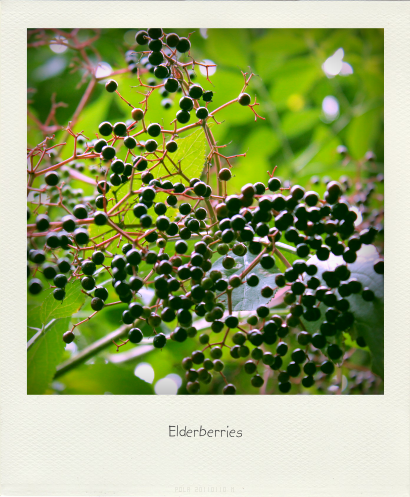 I was after a few to make some elderberry cordial. I swear the berries weren't ripe a couple of weeks ago but suddenly I was seeing stems stripped bare. Time to start picking if I wanted some! Last Sunday's weather was good but forecast to change within the next 24 hours so, tucking a couple of carrier bags into my pockets and my camera over my shoulder, I headed off towards the heath hedgerows. 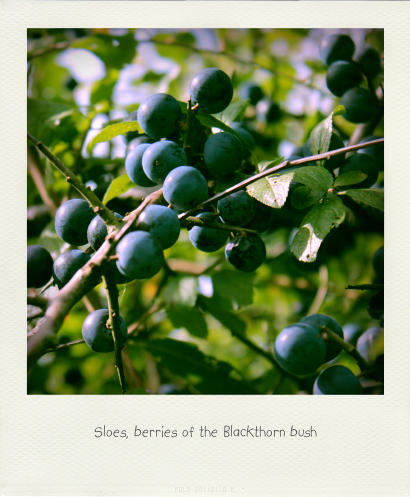 There weren't that many elderberries to be had (I had about 300g of berries after de-stemming and picking out the green ones) but I found a long row of blackthorn bushes covered with sloes, loads of bramble berries and the motherlode of rose hips. Perfect for a Hedgerow Jelly. The rule for hedgerow jelly is to gather only-just-ripe fruit on a dry day. Make the jam straightaway or freeze the fruit until needed. Use any mix of the fruit you find (sloes, hips, haws, bullaces, damsons, berries) and match it 50:50 with sharp apples (cooking or crab apples). Soft fruit usually have low levels of pectin and acid, apples have high levels so the apples are needed to ensure a good set. Back at home my gathered fruit was lightly rinsed (drop of vinegar added) and dried - I like to know that there are no critters lurking. (And there were. We're dealing with nature here. There will be life, lots of it, in the hedgerows. Some people may not like that.) Blackberries were picked over for any insects and grubs, elderberries were taken off the stalks and green berries discarded, rose hips were topped, tailed and then blitzed whole in a food processor. This gave me around a kilo of fruit which I matched with another kilo of cooking apples. Crab apples would have been my first choice but I was unable to find any … for now. Apparently crab apples add a lovely rosy glow to a jelly, something I'd like to see. After adding water and stewing the fruit to draw out the pectin and juices, I popped the fruit into my new jelly bag to strain overnight. 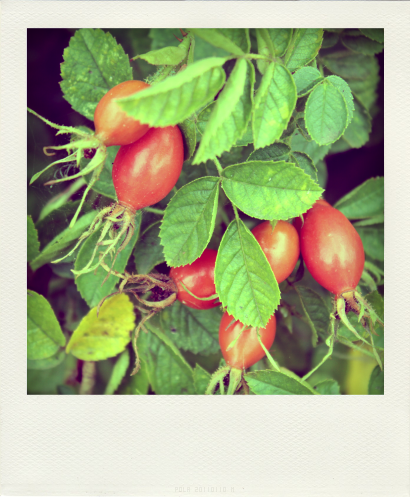 Previously I've faffed about with muslin cloths and ingenious methods of suspending the fruit over a bowl; a tiny accident put a stop to that - it involved some rosehips, a cloth suspended on high, a bowl filled with juice and a plank of wood over the bath followed by a bit of redecorating. This jelly bag, for me, is progress. I had about 1.5 litres of juice the following morning. I thought it was delicious at this stage, if ever so slightly tart. But, onwards. Into the pan it went, brought to the boil, sugar added (not quite as much as the recipe suggested) and brought to a rolling boil until setting point (104 C) was reached. I don't trust the cold saucer test so have a cook's thermometer. About 15 minutes later (using that time to sterilise the jars and lids), I had jelly, of sorts. It still looked very liquid when I poured it into the jars despite the required temperature being reached. Oh well, I thought, it can be reboiled to thicken if needed. And, actually, as it cooled, it set. A bit on the soft side, but I quite like that. We live and learn. 1, I wish I'd put even less sugar in the jam but then, would it have set? Would there be less flavour? I need to better understand the science behind jam making. 2, I was able to blitz my rosehips, seeds and all, because the fruit was being strained so the pips and their surrounding hairs were filtered out. The hairs are an extreme irritant, used in making itching powder! 3, Try to use fruit growing away from the road for less of those kerbside fumes. 4, I'm convinced that jam making, like baking bread and cakes, fulfils some deeply subliminal primeval urge. Despite there being absolutely no need whatsoever to make my own preserves, there is something so satisfying in the process. 5, I haven't gone Polaroid-mad, I've been amusing myself with an app that makes photos look like polaroids. Useful for cards, labels, recipes, etc. Find Pola (for Mac) here. Finally (hurrah! ), passing on some useful information. 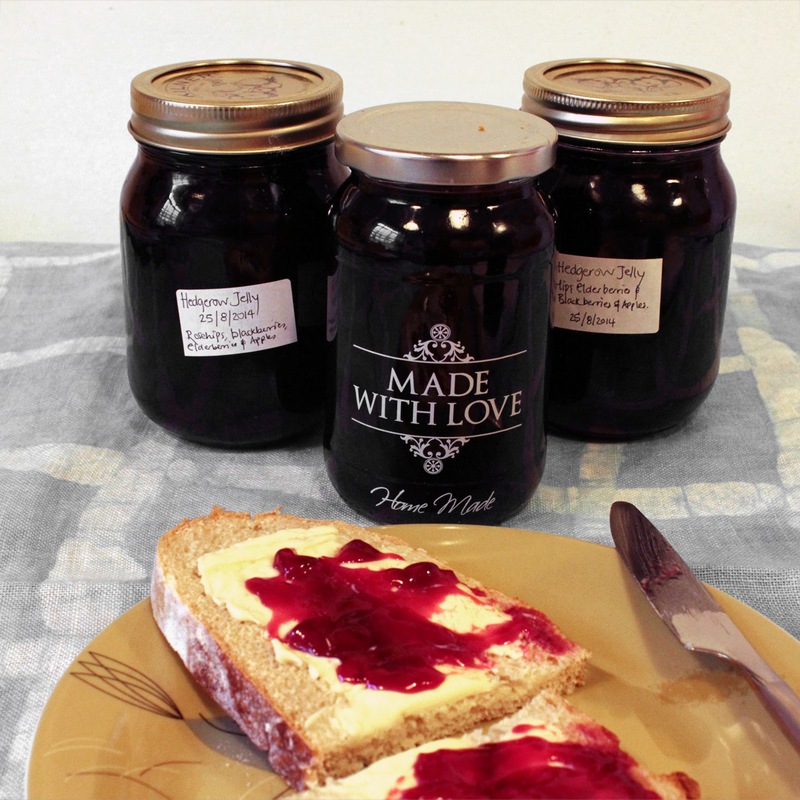 I've found a brilliant website for preserving, Rosie Makes Jam. 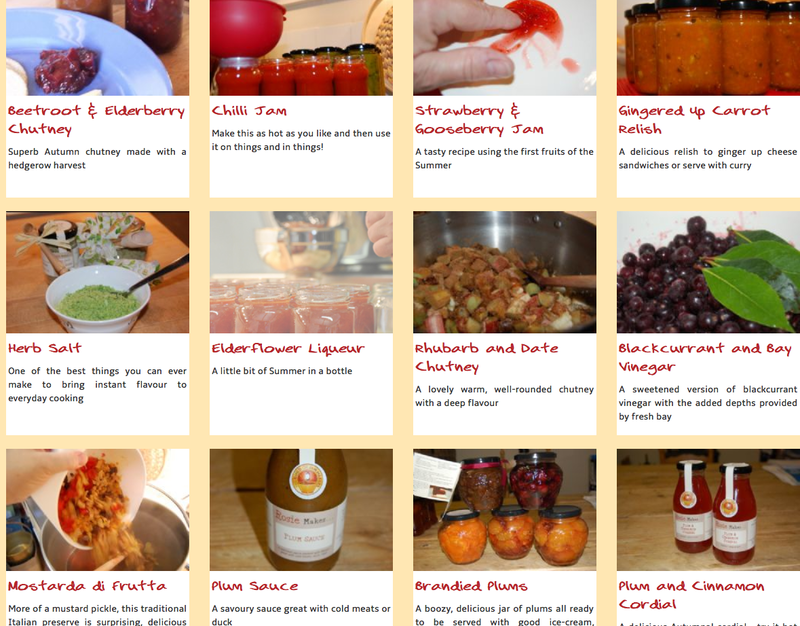 Rosemary Jameson founder of the Guild of Jam Makers, has a plethora of inspiring recipes on her site (Beetroot and Elderberry chutney, anyone?) and links to her shop where she sells jars, etc. My favourite is the ingredient calculator that converts the recipe to the amounts available. Invaluable. … to sow a few seeds before late summer turns into autumn. Having planted out my winter veg and cleared the last of the peas, I really want something else to look forward to. I remember the first year my friends and I started the veg patch: by the time we were ready to sow anything, it was mid-August. 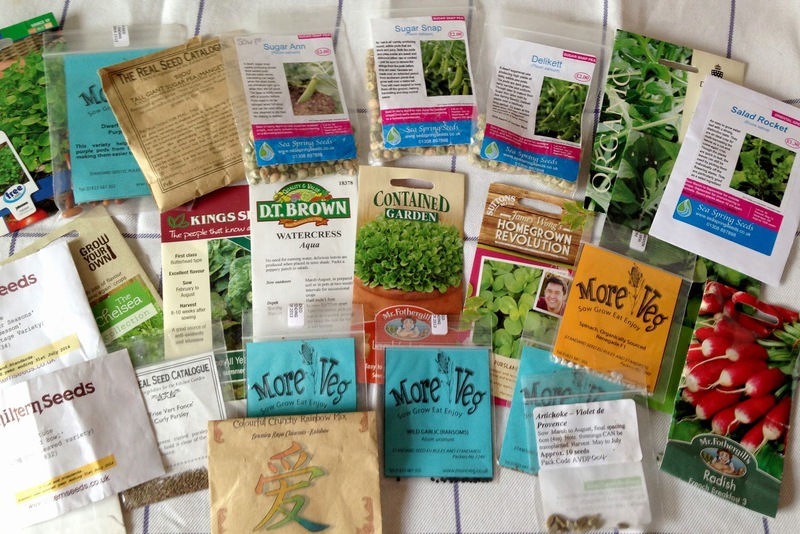 It was a warm month and, not knowing any better, we sowed what we had in our seed boxes. As a reward for our optimism, we were helping ourselves to lettuce leaves before the year end although the beets were small and the spring onions spindly. We protected the crops with fleece over a snowy winter and were eating fresh from the garden in early April. It was a lesson that, strangely, has not been repeated until now. A couple of weeks ago, a quick trawl through my seed box showed what was possible. I pulled out seeds that could be sown until late July, others that were best sown in August for a late autumn or early spring crop, and even more seeds to be sown in September to germinate ready for next year. I've sowed ruby chard, two types of spinach, some radishes, rocket, parsley, shimonita onions, some quick growing baby carrots and several rows of lettuce - a butterhead 'Marvel of Four Seasons' and 'Salad Bowl', a cos type. And just in case we have a nice slow decline into winter, some beetroot for baby beets. When I checked today, the warm rain of the past few days has coaxed all of the seeds into life. I'll keep a watch for first frosts and then have to fleece the beds but the plants will be off to a good start by then. There's also plenty of flowers best sown in the autumn for strong early plants next year. My photo above shows a selection of what I'll be sowing: poppies, hollyhocks, wallflowers, nigella, calendula, honesty. (As well as more tulips.) My spring-sown flowers didn't do well this year and I'm planning for better next year. I'm going to prune the plum trees this weekend. Stoned fruit trees need to have any essential pruning done in the summer months, preferably after fruiting. Leaving it much later (as in I should probably have done it already) will leave the pruning wounds vulnerable to possible airborne viruses; doing it now gives the cuts time to heal over before the tree goes into dormancy. I'm going to take a few branches out of the centre to let in light and air, hopefully with better fruiting results next year. And if there's time leftover, I'll be tidying and weeding some space for my next seed sowing session. As we're bang in the middle of the preserving season, jars and bottles are easily bought (if you haven't been carefully storing recycled jars all year), so it's apt timing to think of how summer flavours can be saved for the winter months. Leaving aside the hedgerow harvests for a moment (elderberries, blackberries, bullaces /sloes and rose hips seen on a recent walk), I've been tackling garden produce. Nasturtium flowers (Tropaeolum) are still growing yet this is the time that lots of fruit (aka seedpods) are dropping into the soil ready to sprout into new plants next year. There's only so many nasturtium seedlings that a garden needs so I've been picking off a few pods before they can fall, destined for the kitchen to be transformed into Tropa-capers (rather than proper capers). True capers are the flower buds of the caper shrub (Capparis spinosa) and, once pickled, are a popular ingredient in Italian cooking, especially in pizzas, salads and pasta sauces. Here in the UK, capers are traditionally used to make Tartare Sauce, among other things, which is commonly eaten as a garnish for fish and is particularly nice with salmon. (Although watercress sauce is even better. But I digress.) Capers are relatively expensive to buy but I read that nasturtium seedpods develop a very similar taste and texture to capers when pickled. And so I embarked on nasturtium experiment number two. This time my inspiration was drawn from Alex Mitchell's book 'The Rurbanite' - and I have to mention that I'm listed in the book as Alex came over when writing it, had a chat over a cup of tea and a look round the veg patch. As this was several years ago, I'm inordinately proud of being credited in the back pages as 'Veg Grower'. 'Empress of India' seedpod from a lovely deep crimson flower. Having soaked and drained them, I divided them into 2 sterilised jars and topped this up with cold white wine vinegar to cover them. At this stage, you can decide whether to add herbs or not. I chose to add bay leaves round the edge (decorative and flavoursome) and a swirl of fennel and a couple of lemon verbena leaves on the top as that's what I had to hand. Tarragon leaves are also recommended. How easy is that? Now I just have to leave them for a couple of weeks to let the flavours develop and then I have a whole year to use the jar up. If I'm honest, the last time I bought a jar of capers, they sat at the back of the cupboard until their use by date when I kicked myself for wasting money while throwing them in the bin. I'd needed them for a recipe which I then couldn't find again. If the same happens again, this time it will only have cost me the vinegar - a small comfort. By the way, if you don't like the taste of vinegar, the smaller fresh seedpods can be washed and added direct to salads, pasta or pizza. They have a peppery taste and crunchy texture. But don't try and store them fresh as they'll quickly go soft and, left in water, will start to smell in a most off-putting way. As a complete procrastination from doing other rather dull things this morning, I've used the top photo to create a jar label, thinking to pretty the jar up for a gift. 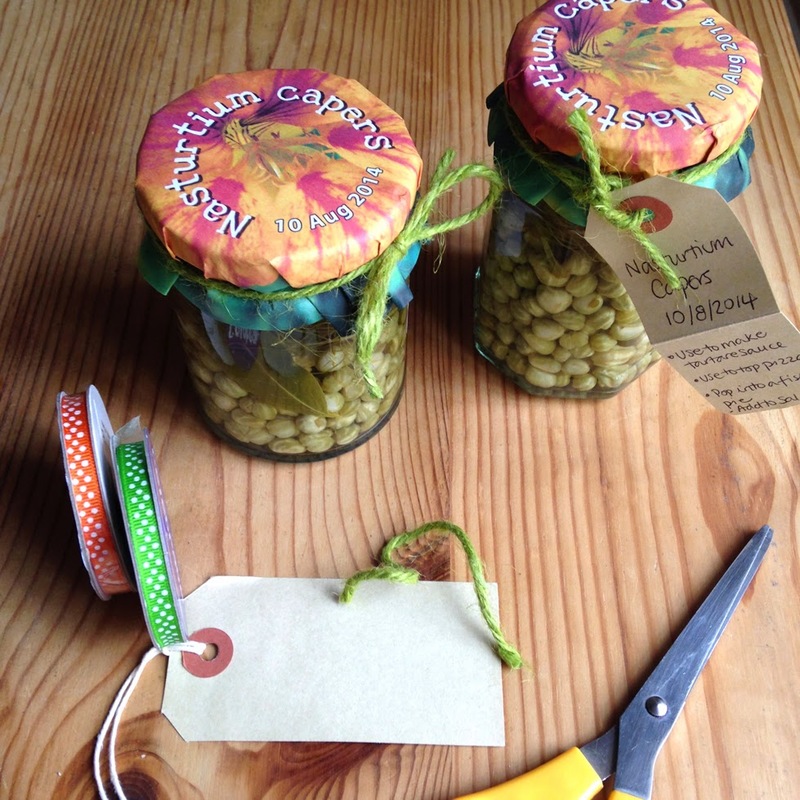 (I have a neighbour who says she adores eating capers; I want to see what she thinks of these.) I tried tying with a ribbon but prefer the rustic look of a length of Nutscene garden twine. This is the result. 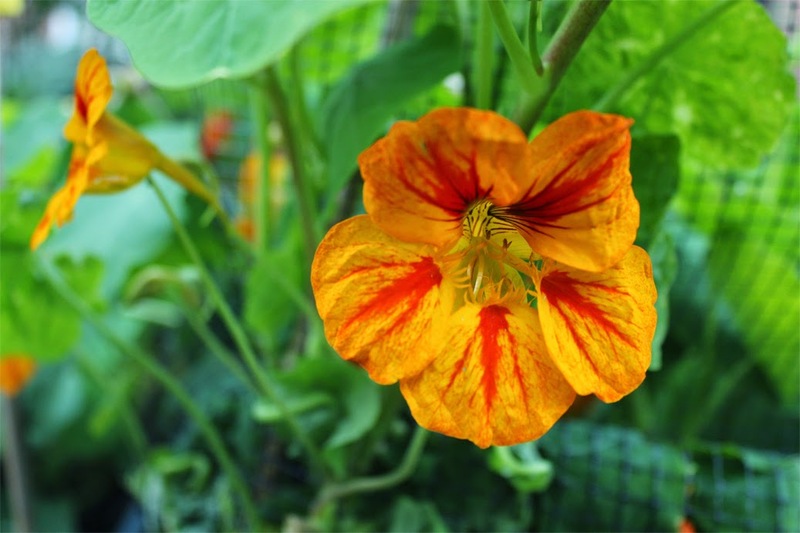 Update: Nasturtiums are genetically related to watercress. 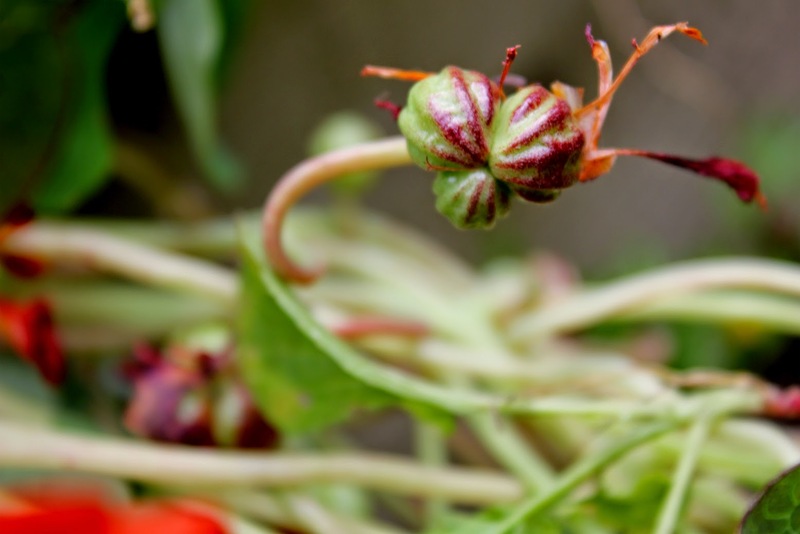 Think of the strong peppery taste of those leaves and you'll have an approximation of the taste of nasturtium pods. Hmm, I'm now wondering if I could make nasturtium soup (as watercress soup is one of my favourites). It's not so much that I love to grow nasturtiums (I do) but that they love to grow for me. Every year, around this time, they seem to take over their corner of the garden, stretching multiple stems out to sprawl among the veg, growing through netting and up poles (with help). By now the stems can be over four feet long and covered with flowers and then fat 3-part seedpods. These seedpods are so numerous that it's impossible to prevent them sinking quietly into the soil where they decompose to provide next year's flood tide of nasturtiums. It's a self-perpetuating cycle. I seem to have inadvertently ended up with quite a few prolific self-seeders in the garden (orach, fennel, linaria, aquilegia) and nasturtiums rank highly among these. Luckily, nasturtium (Tropaeolum majus) is a bit of a wonder plant - I've been discovering that it's not just a pretty face but really earns its keep in the edible garden. Because of its antibacterial, antiseptic and antibiotic qualities, it has many medicinal uses; an infusion of the leaves can help treat respiratory tract infections such as bronchitis, flu and colds (probably best taken with honey). Additionally, because it's antiseptic, a poultice of the leaves can be applied to wounds; admittedly unlikely to be useful to urban or suburban dwellers but, well, you never know. Back in the kitchen, I already knew that the young lilypad-like leaves can add a peppery bite to salads or be used when making pesto. The flowers, being edible, can make a tasty addition to salads, a summer fruit bowl or jug of party drinks. Or get creative and top a pizza with them for a girlie teenage sleepover party? I can't guarantee the reaction but it just might be cool enough to be acceptable. Florally speaking, I've found that newly-opened flowers, freshly picked, will last for up to a week in a glass (or vase!) of water - make a sweet country garden arrangement by adding herbs such as fennel, lovage or mint which also last well in water. It helps that in the garden they're a bee magnet and I grow nasturtiums in every shade from deep red through orange to cream. My favourites are a glamorous showstopper called 'Black Velvet' and its alter-ego 'Milkmaid'. But it was to the orange ones that I turned when I decided to make nasturtium vinegar last month. I'm quite partial to honey and mustard dressing or, let's face it, a big dollop of mayonnaise (yes, from a jar). But, flicking through Pam-the-Jam's preserve book for the River Cottage series, I couldn't resist the lure of discovering another use for all the nasturtiums in the garden - flavoured vinegar. The method is simple enough: a wide-necked jar packed full of flowers, a small palmful of seed pods, a few peppercorns, some salt and a couple of chopped shallots. 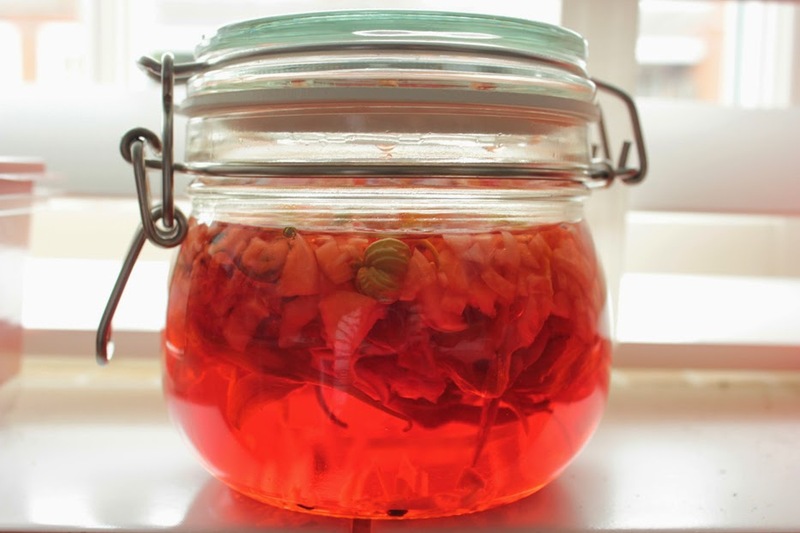 Cover with white wine vinegar (obviously, use a good one), seal and leave on a sunny windowsill for about a month, giving it a little shake every so often. 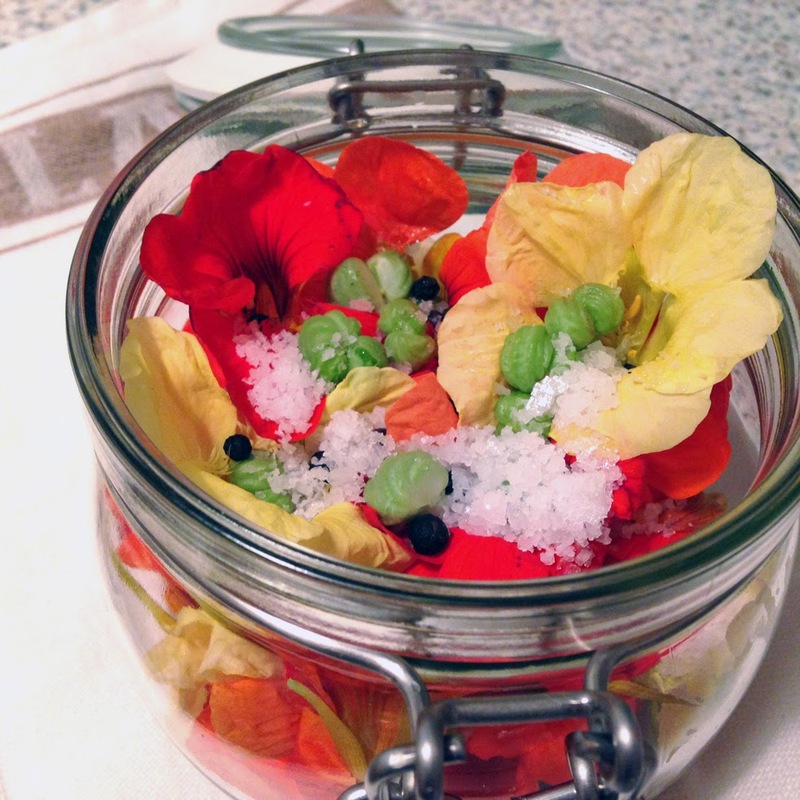 … then strain into a clean jar and add fresh flowers. I started a jar off in July and my vinegar project is now complete, with the now-pink vinegar strained into a clean jar with a few extra flowers added. The taste is subtle but pleasing. The original recipe suggests using it in a dressing made with 1 tablespoon of soy sauce, 100ml nasturtium vinegar and 200ml olive oil. Mmmm, yum - a delicious way to bring a fresh tang to your salads. Thinking ahead: I'm a big fan of presents with a bit of thought and effort behind them. 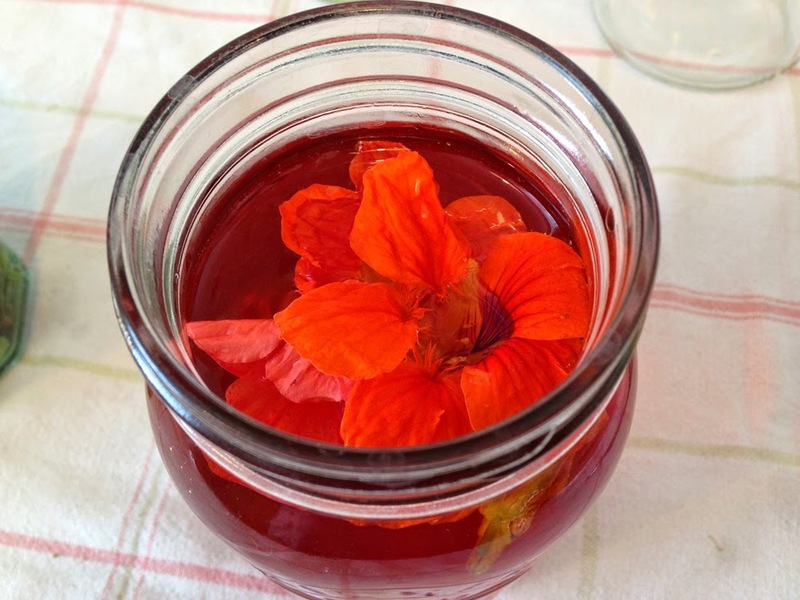 In a beautiful bottle or jar, with a ribbon and hand-written label, I think a bottle of nasturtium vinegar would make a simple and unusual present for a keen cook. Nasturtiums will start to slow down by the end of this month - although they won't keel over until the first frosts - so this is a project that's best started now. 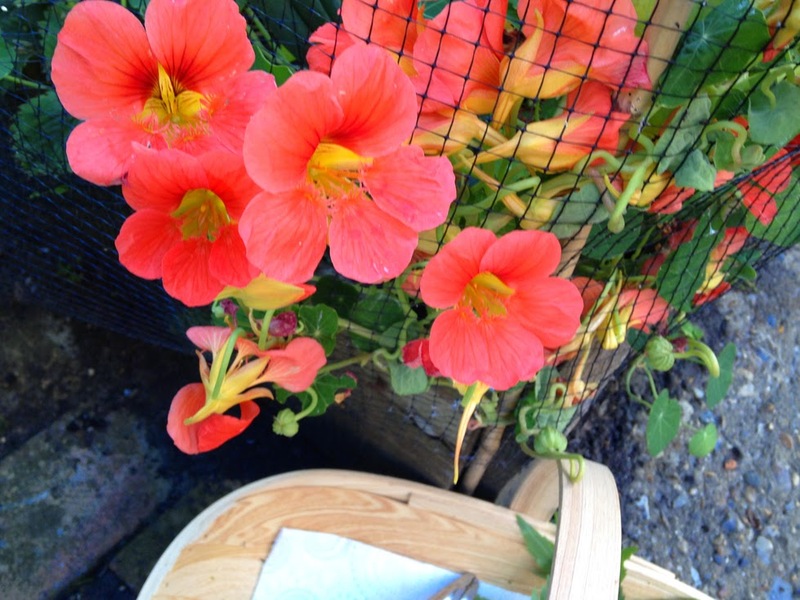 It's also a great project to do with children, especially if they're the ones growing the nasturtiums next year. 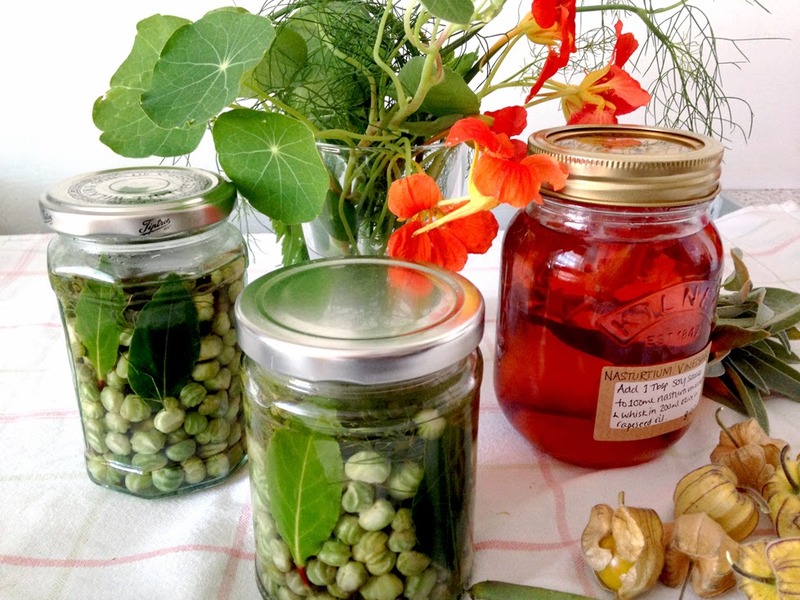 In the photo below, you'll see a couple of jars of 'capers' from nasturtium seed pods. Right now is an excellent time to be gathering these - and a useful way of reducing the tide of seedlings next year. More about these in the next post. 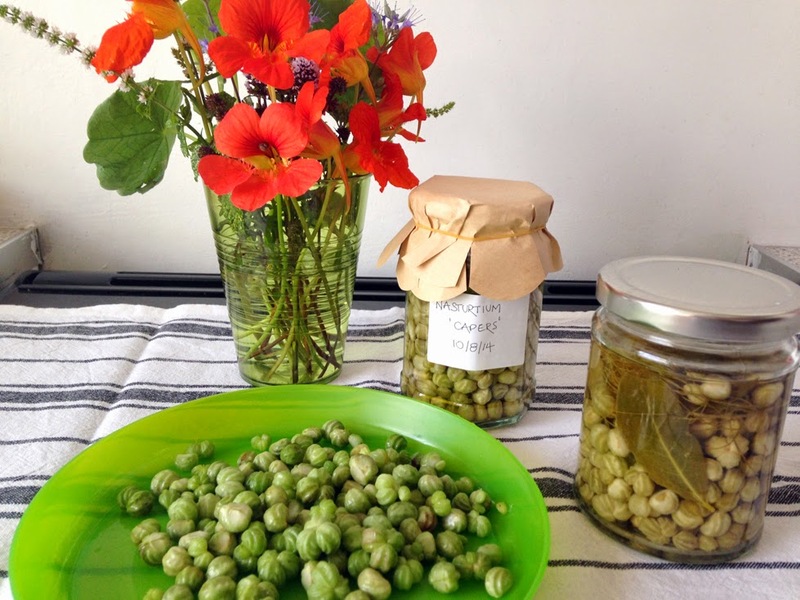 Herbed nasturtium capers, nasturtium vinegar and a pretty vase for the kitchen windowsill.